TIM DOWNSis a Phi Beta Kappa graduate of Indiana University in Graphic Design. After graduation in 1976 he created a comic strip,Downstown, which was syndicated by Universal Press Syndicate. His cartooning has appeared in more than a hundred newspapers worldwide. In 1979 he joined the staff of Campus Crusade for Christ, where he founded and directed the Communication Center, a communication training facility. He continues to serve as a speaker and writer. He and his wife, Joy, have spoken at FamilyLife Marriage and Parenting Conferences since 1985. He is author ofFirst the Dead, Less Than Dead, Chop Shop, Head Game, Plague Maker, Shoo Fly Pie, andFinding Common Ground, which was awarded the Gold Medallion Award in 2000. He is also co-author ofFight FairandThe Seven Conflicts: Resolving the Most Common Disagreements in Marriagealong with his wife Joy. Tim lives in Cary, North Carolina, with his wife and three children.JOY DOWNSis a 1979 graduate of Indiana University in Journalism. After graduation, she joined the staff of Campus Crusade for Christ where she served as a radio writer and producer and helped direct the Communication Center, a communication training facility of Campus Crusade. Joy and her husband, Tim, have spoken at FamilyLife Marriage and Parenting Conferences. Together they have co-authored two books entitledThe Seven Conflicts: Resolving the Most Common Disagreements in MarriageandFight Fair! : Winning at Conflict without Losing at Love. Joy lives in Cary, North Carolina, with her husband and three children. Sometimes a conflict is more than a simple disagreement--it's a virtual clash of worldviews, and the disagreement appears impossible to resolve because it seems inconceivable to consider the issue from any perspective other than the one you know to be correct. Thus, the title of the book... One of Us Must Be Crazy... and I'm Pretty Sure It's You. In this companion to Fight Fair! 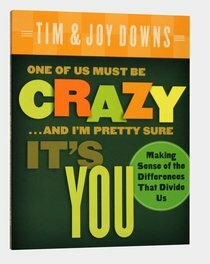 (a treatise on "winning at conflict without losing at love"), Tim and Joy Downs capture the heart of marital differences. This time they concentrate less on how to fight fair, and more on making sense of the differences that divide us. With marriages coming under attack from seemingly every angle these days, conflict is seen as grounds to end a marriage, rather than an opportunity to grow closer to each other and to God. One of Us Must Be Crazy... and I'm Pretty Sure It's You is a unique and manageable resource for equipping couples to learn the true nature of their conflicts and deal with them in a way that will actually help their marital fulfillment. By interacting candidly and honestly with such issues as security, loyalty, responsibility, caring, order, openness, and connection, Tim and Joy Downs have created a resource that might simply make all the difference in your world. About "One of Us Must Be Crazy... and I'm Pretty Sure It's You"
Tim Downs is a professional speaker and writer and has worked as a nationally syndicated cartoonist for fourteen years. His first book, "Finding Common Ground", was awarded the Evangelical Christian Publishing Association's prestigious Gold Medallion Award. He has coauthored two other works of nonfiction with his wife, Joy. Tim and Joy are on the staff of Campus Crusade for Christ and live in Cary, North Carolina, with their three children. 9. What Are We Fighting For?